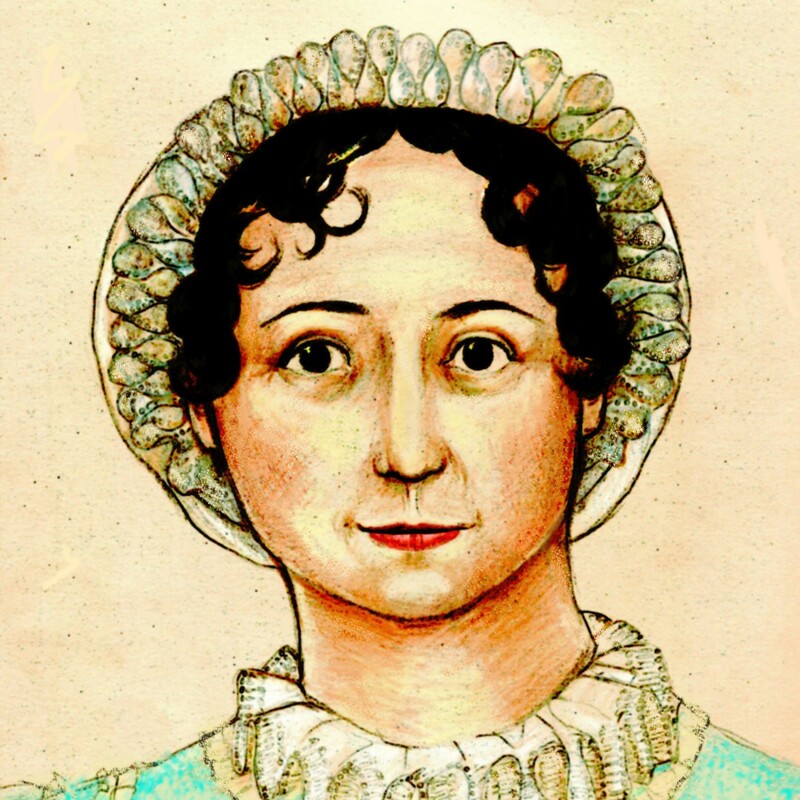 It’s probably safe to say that all Janeites have had at least one moment of curiosity about what Jane Austen looked like. We don’t have much to go on–a dashed-off, incomplete, badly faded watercolor by Cassandra Austen is the only authenticated image of Jane Austen’s face, which has both frustrated Austen fans as well as inspiring them to create something better. 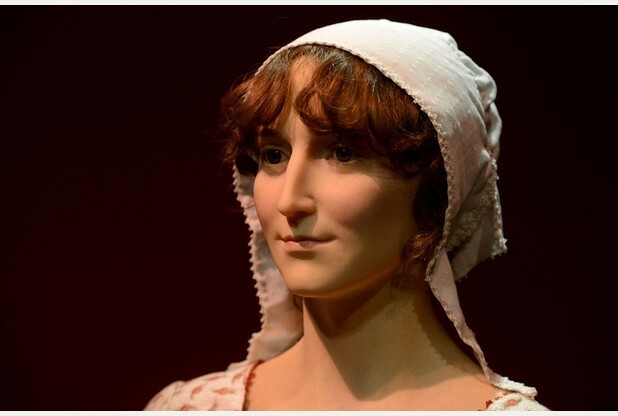 Today, the Jane Austen Centre at Bath unveiled a wax figure of Jane Austen, created by sculptor Mark Richards (the BBC has a shorter piece with a video interview of the sculptor), inspired by Melissa Dring’s forensic painting of Austen, done several years ago also for the Jane Austen Centre. The painting has received a mixed reception from Janeites, and we are not terribly fond of it, but we like this wax figure rather better. In fact, we like it quite a bit. That’s not to say it’s perfect. We feel like the face is too angular. Austen was described by several people who knew her as having a “round” face, or at least round cheeks. There is something of that in the waxwork, but still, to us the chin is too pointy and the cheeks a bit sunken. We heard some complaints on Facebook that the figure’s hair color was wrong, too light for Jane. Her hair has been described as auburn, so we’re okay with the hair color, but others have said they think of it as darker–and you know, that’s okay, too. In Cassandra’s portrait, the hair and eyes are the most complete and detailed parts, and the hair was certainly darker, more brown than red. We would like to see a hair color that is not necessarily darker, but is richer. It’s not so much that it’s too light, but it’s kind of washed-out, like she’s been shampooing with something containing sulfates. (Paging Chaz Dean!) We hope the folks that put this together didn’t take too much inspiration from the sadly faded lock of Austen’s hair on display at Jane Austen’s House Museum. The fading is quite obvious and, we suspect, extensive. Austen’s costume was designed by Andrea Galer, who has designed costumes for several Austen-related films. We love the fabric, but the gown seems quite thin and low-cut; there’s a little too much of “modern interpretation of period fashion” about it, in our opinion. More bluntly, she needs a chemisette before she catches a cold, or scandalizes the neighborhood. A while back, we wrote a Closer Look post here on the blog about images of Jane Austen. We think the overview stands up pretty well (and in fact used it as the basis of a shorter piece on the subject in our upcoming book), particularly the bit at the end about our own thoughts about what Jane Austen looked like. The actress Anna Chancellor, who played Caroline Bingley in P&P 1995, is descended from Jane’s brother Edward. We think she very possibly bears a family resemblance to her famous aunt. So how does the wax figure hold up against this bold and even reckless declaration? Things that make you go hmmmmmm! What do you think of the wax figure, Gentle Reader? My first impression was favorable (much better than the portrait commissioned by the Centre that makes me cringe). I am skeptical about the hair too, but the style bothers me the most. Did Regency era ladies have long bangs that covered their eyebrows and the skimmed their line of sight? It seems like a last minute change to me to soften the too angular face. And where the heck is the topaz cross??? The wax figure’s expression still seems a bit to placid to me. It seems to draw more from the myth created by Austen’s nephew of Jane Austen as this sweet maiden aunt who never would think to say anything controversial to anyone. Reading her uncensored letters paints a different picture of Austen Remember this is a woman who made jokes about stillborn babies. For all it’s sloppiness I enjoy the straight forward unabashed gaze of Cassandra’s painting. I strongly agree with digne. Much too placid. Compared to the Clarke sketch, which shows a very flamboyant Austen, this is solidly in the “dowdy maiden aunt” category and perpetuates that negative Victorian image of her. This is not the woman with the ironic, wicked humor. I agree with the criticisms expressed so far: face too angular, dress too low, bangs too long, expression too placid, but on the whole, far better than the red cheeks portrait. While I’d love if if we had more portraits of Austen done while she was alive, I do like Cassandra’s sketch, and Jane’s expression in it, best. I think my favorite sketch of Jane by Cassandra is one that isn’t actually of Jane, but of Mary Queen of Scots. (http://austenprose.files.wordpress.com/2010/12/history-of-england-illustrations-by-cassandra-austen.jpg – thanks Austenprose for having a picture! Mary is the one in the middle.) Theoretically the portraits in the work are thought to perhaps be inside family jokes as well as jokes on the monarchs in question. This picture, combined with Clarke’s (glorious!) sketch, make the wax figure a bit disappointing for its lack of high, wide, red, mirthful cheekbones. Agree: too placid, Jean Shrimpton hair, face too thin, no round cheeks. “If I must give my opinion,” as Jane Austen wrote; and I have written a blog post about it. I wish Houston had Jane Austen Social Club, so I can experience her social life in her country, and I won’t go all the way to other State to have fun. I believe I like the waxwork with a few proviso’s, the hair as everyone is saying is too light, and she should be fuller in face and figure as women were then. But all in all it is and interesting likeness and on my Facebook page you will find a better pic of Anna and Jane. I do not know what Elizabeth Bennet looked like. I do not know what Anne Elliot looked like. I do not know what Elinor Dashwood looked like. I do not know how Catherine Moreland looked. I wouldn’t recognize Fanny Price in a bus or subway. I know Emma Woodhouse’s features were handsome, but I need to construct her image for myself in my own mind each time we meet.. Yet I KNOW all these women intimately—as intimately as their creator wished me to know them — and I love them. I am okay with all that. Well, as a manly observer, I think she looks quite fetching! Compare/contrast this image with the one that surfaced awhile back on the attached link. There are indeed some similarities. I’d rather my mental image of Jane Austen appear larger than life, as opposed to small and mousy. I don’t actually hate the waxwork as much as I expected to, except that I agree with Diana that she seems to be having a really bad hair day. But if I were the Duchess of Austenland, my first decree would be that we immediately cease all attempts to figure out what JA looked like. In the end, it doesn’t matter. See Elsa’s comment above. (1) I thought at the time you made the original comment about Anna Chancellor that she looks a LOT like all of the extant portraits of Lady Knatchbull (Fanny Knight as was)–in keeping with her Knight family descent. (2) But re: JA, check out the various photographs of Admiral Sir Francis Austen in old age (he was the only sibling who lived long enough to be photographed). I think the resemblance between those and Cassandra’s sketch of JA is pretty good. That’s my story and I’m sticking to it. It’s a young aunt Gardiner (from BBC’s P&P ’95) with brown contacts after she got a pail of chestnut tint poured over her head! This also explains why her normally meticulous hair is hanging in her eyes in that unseemly and unpractical fashion. P.S. To prove why I think the resemblance is uncanny take a look at the pic of Joanna Davis in/with Morse on this page: http://pandp2.home.comcast.net/~pandp2/pandp2cast/david.html – all that’s missing is changing the hair a bit, y/y? Also, as far as the forensic portraits go: I saw another show on PBS and the same artist painted, I think it was, Attilla the Hun. Now, I’m not running AttillatheHunBlog so I’m not going to get to excited about it, so giving it a disinterested inspection, I thought for the type of work she did, her painting style was a little too impressionistic. I felt like the image needed to be more precise–does that make sense? And I think her painting of JA had the same problem. And my favorite portrait painter is John Singer Sargent, who was impressionistic himself, so it’s not like I’m prejudiced against that style for portraits or anything. So maybe it’s just that her style doesn’t work for me (and a lot of other people). We might have liked something with more precision. But the impressionism probably lends itself well to painting someone you can’t actually see.